From their Wager Task Housemates concentrated and encouraged each other through last Night’s Game session in the Arena. They had to use their card skills coupled together with their aim to lodge a card in a Watermelon. They also had to use their blowing techniques as they had blow five balls across six shot glasses into a glass of water after going through biggies obstacle course. Regardless of their previous losses, the Housemates encouraged each other but they all looked like this week had taken its toll on them. They all cheered each other on and ThinTallTony came out victorious. 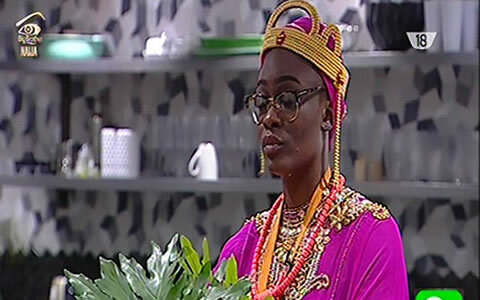 Uriel was the lucky Housemate to be singled out as ThinTallTony’s fellow to share in the cool prize he won in Biggie’s Luxury Room. With the game changing every minute, how will ThinTallTony use his alone time with Uriel in the context of the game. Has ThinTallTony recognised a fellow player who is a rival? Was his choice strategic?